The advances in big data, analytics and the cloud have propelled customers like the Dallas Zoo to simply do more than they ever thought possible. For Dallas Zoo, this has meant personalized tracking of their elephants; storing years of RFID data and integrating it with attendance, weather and moon cycle data for an integrated analytical experience. The challenge many customers, like Dallas Zoo, have faced is that this new wave of analytics demands significantly more computing resources to efficiently process, analyze and visualize these vast datasets. Today, I am excited to announce the upcoming availability of a new, faster performance tier for Azure SQL Data Warehouse. Azure SQL Data Warehouse (SQL DW) is a fully managed, petabyte-scale cloud service for data warehousing. 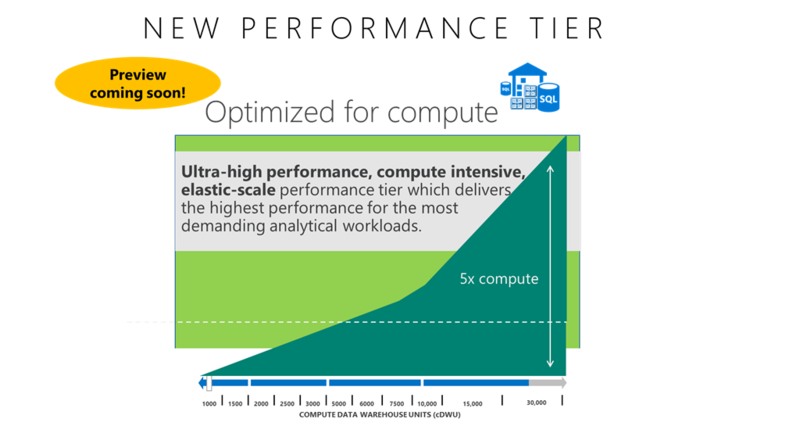 The new compute optimized performance tier is designed for customers that need high performance and massive scale to meet the needs of compute intensive analytical workloads. This performance tier is being used today by a select set of customers and will be available in preview this fall. The compute optimized performance tier brings several benefits to your analytics workloads. The first benefit can be seen through dramatically improved query performance. Individual query execution times have improved by as much as 10x. We’ve also seen some fantastic results with customer workloads and benchmarks where queries are completing twice as fast on average. The compute and storage scalability has also been dramatically increased with this performance tier. You can now provision 5x the computing power and store an unlimited amount of columnar data, empowering you to run your largest and most complex analytics workloads. This new performance tier takes advantage of the latest generation of Azure hardware. Local, low-latency Non-Volatile Memory Express (NVMe) based solid state disks have been combined with increased system memory to create an automated, tiered caching solution for your data. By keeping the data close to the CPUs, significant gains in performance are realized. Remote I/O operations are only required to bring data in from remote storage when needed; ensuring that the latest, hottest and in demand data is right where you need it. The optimized for compute performance tier retains all the value that is available in Azure SQL Data Warehouse today while offering increased performance, higher compute scale and the ability to store unlimited columnar data. Compute is separated from storage and the elastic functionality of pause, resume and scale on demand have all been maintained. This elastic cloud infrastructure is also matched with some of the richest SQL language support giving you a great scale out database to build on. Get started with provisioning your SQL Data Warehouse today in the Azure Portal or request an Extended Free Trial. It only takes a few minutes to provision a data warehouse so you will be up and running in no time at all. This fall, you will be able preview the new ‘optimized for compute’ performance tier. We look forward to hearing about your experience with SQL Data Warehouse and this new performance tier.